As an ISO 9001:2008 certified company, we manufacture automated and semi-automated rotational moulding machinery in array of various sizes. These CE Marked rotational moulding machines consist of a cooling chamber, one oven, mould spindles and moulds. 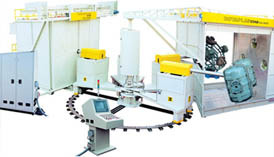 Our machines provide homogeneous coating of the plastic inside every mould. This is ensured by mounting the mould spindles on a rotating axis. By utilizing our high quality rotational moulding machinery, clients can lower their cost of production for any kind of plastic rotationally moulded products and moulds. This flexibility is very important for catering to the varying demands of the market. This has all the standard features as described in our rotational moulding machines with same heating chamber, cooling chamber, arms and controlling system. Equipped with state of the art technology these rotational moulding machines are highly reliable, durable and efficient in delivering high output. Our latest shuttle type rotational moulding machines are highly advanced in work effeciency and technology. Interplas is UK's largest plastic industry exhibition held triennialy, which showcases all types of plastic manufacturing technologies, services and machinery like rotational moulding, injection moulding, thermoforming, etc. which is essential for plastic industry. This exhibition opens lots of opportunities for plastic manufacturers, suppliers, exporters, distributors and traders from worldwide. Using cost-effective heat transfer technology, these are precisely designed for the space saving chambers. These insulation panels are designed at our sophisticated infrastructure which makes the working atmosphere healthy. With the help of high quality straight-arm with four mold carrying carrier plates, we have been able to make the working environment better and cost-effective. These are specially designed by using modern cost-effective heat transfer technology for the space saving chambers. Using advanced technologies in designing the insulation panels which makes the working environment efficient. Required safety devices like indicators, interlocking and alarm are fitted with machine controls. Microprocessor based machine control panel are provided with digital display. For major and minor speed controls, variable speed a/c motors are available. Eco-friendly burners are perfect solution for CNG/LPG/OIL/Duel fuels. Article like boats, drainage pipes, etc. can be made easily without any trouble. Speed variable drive is available for rocking & rolling and good control over the product. Thickness of the products can be customized. Customized PLC on clients request. Mould Indexing are also accessible. If you are in search of a company that can offer detailed information about avant-garde rotational moulding machinery, then this is the place to be. 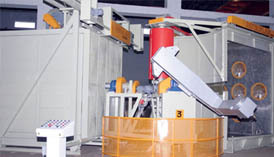 We manufacture and supply 3-4 arm rotational moulding machinery, extruder machines, pulverisers and others with latest technology and techniques. We have a research and development unit, which is handled by a competent team of researchers, who support us with all latest technology so that our machines and products can be of state of the art technology. We have given complete attention to government laws and regulation of public safety, zoning and environmental safety. We possess the latest cutting machine, lathe machine, casting machine etc. Further, to design more convenient and sophisticated rotational moulding machines we have empowered our designers with digital designing software. Thanks to our research & development team for placing us ahead of our competitors in terms of technology & quality. Feel free to contact us to buy or for more information on any types of rotational moulding mahcinery. Home | Product Range | Sourcing Requirments | Rotational FAQS?